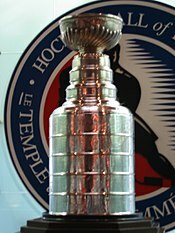 The 1996–97 NHL season was the 80th regular season of the National Hockey League. The Stanley Cup winners were the Detroit Red Wings. They swept the Philadelphia Flyers in four games. The Red Wings had not won the Stanley Cup for 42 years. The Boston Bruins recorded the league's worst record, missing the playoffs for the first time in thirty seasons and ending the longest number of years in a row in the playoffs ever recorded in the history of North American professional sport. This page was last changed on 11 November 2016, at 17:38.